Stereotactic ablative radiotherapy (SABR), also known as stereotactic body radiation therapy (SBRT) is one of the most preferred treatment techniques for early-stage lung cancer. SABR delivers a very high dose of radiation in a short period, and it is usually delivered either as a single fraction or as fractionated high-dose radiotherapy in less than five fractions. SABR is exclusively used for well-defined small tumors with clear margins. Delivery of high dose of radiotherapy in a short period requires rigorous quality assurance (QA) to ensure the target receives the prescription dose with a rapid dose fall-off outside the target volume. AAPM TG 101 protocol  recommends a high level of confidence in the entire chain of the treatment process that includes immobilization, imaging, simulation, treatment planning, transfer of treatment parameters to the delivery system, treatment delivery, verification of target position before treatment delivery, and continual monitoring during treatment. QA in radiotherapy can be grouped into two broad categories: Machine related and patient specific. AAPM TG-142 recommends daily, monthly, and annual QA for radiotherapy imaging and treatment delivery systems. It imposes tighter tolerances for stereotactic radiosurgery/SBRT/SABR treatment techniques compared to intensity-modulated radiation therapy (IMRT) and three-dimensional conformal radiation therapy (3D-CRT) treatments. Patient-specific QA, also known as end to end test is an important component of the treatment process which aids the physicist to identify any issues associated with the treatment plan or the delivery system. With the success of SABR in lung cancers, the technique has been extended to other treatment sites such as spine, liver, scapula, sternum, kidney, hip, adrenal glands, and prostate. This has resulted in an increased physics QA time on treatment machines. In SABR, pretreatment QA/patient specific QA includes both absolute and relative dosimetry. Absolute dosimetry is usually performed in a water equivalent phantom, and the dose is measured using an ionization chamber at a predefined depth. Relative dosimetry employs the use of film at a predefined plane inside the phantom. Both these processes are time-consuming and may involve a significant amount of physics time outside normal clinical hours. Recently, the use of detector arrays including MapCheck, 2D ion chamber array and the Octavius phantom,, ArcCHECK (AC), and ScandiDos Delta4 have become a standard QA device for IMRT and volumetric modulated radiation therapy. This practice saves a significant amount of physics time by minimizing the use of ionization chamber- and film-based patient-specific QA. However, point dose measurement would still be required in situ ations where gamma analysis and/or second MUs fail. The use of small fields in SABR techniques requires a high spatial resolution device to mimic film dosimetry. Moreover, plans using non-coplanar small fields have the potential to introduce dosimetric uncertainties when incident on the edges/corners of a given phantom. In addition to this, the detector capability to record the dose for targets positioned away from the isocenter needs to be assessed. Hence, this study has been designed to investigate the use of AC as a tool for conducting pre-treatment QA of 3D-CRT, IMRT, and volumetric-modulated arc therapy (VMAT) SABR plans for different sites. Twenty-five patients having different diagnoses of lung, spine, sacrum, sternum, rib, scapula, and head of the femur (acetabulum) undergoing SABR were selected for this study. In the case of lung tumors, the maximum intensity projection (MIP) images were used to define the target volume to account for tumor motion during treatment. The MIP and average intensity projection images used for dose calculation were reconstructed on a Philips Brilliance ™ 4D CT scanner using the bellows system. Treatment plans were generated on an Eclipe ™ treatment planning system (TPS). A grid size of 2.5 mm was used for dose calculation in all cases. [Figure 1] illustrates the beam arrangements and planning target volume (PTV) dose coverage for six different sites used in this study. Before treating the patients, pre-treatment QA was performed on all approved treatment plans including ion chamber measurements and film dosimetry. A CC13 ionization chamber was placed inside an in-house designed solid perspex phantom known as rod phantom [Figure 2]. The rod phantom consists of multiple perspex slabs stacked together and has a dimension of 35 cm length and 20 cm height. It is designed to mimic the shape of the thorax and has provisions for placing films, ion chambers, and thermoluminescent dosimeters. The film slot has three pins which aid in film registration and to identify the film orientation. The phantom facilitates the measurement of both absolute (ionization chamber) and relative dosimetry (film) simultaneously. Before performing patient-specific QA in the rod phantom, a known dose for the 10 cm × 10 cm field size at the patient-specific beam energy was delivered to cross-check the output on the day of QA and to compare the dose derived from the treatment planning at the measurement point. The radiochromic films used in this study were manufactured by the International Specialty Products and supplied by CMS Alphatech as Gafchromic EBT3 films. To generate calibration curves, EBT3 films were cut into 2 cm × 2 cm sizes and irradiated to different doses (0 to prescription dose [PD] in steps of 3 Gy, PD + 5 Gy, PD + 10 Gy) scaled according to the PD [Figure 3]a. However, the dose scaling varies with the prescription dose. Before QA, the EBT3 films were resized to 12.5 cm × 20.5 cm to fit in the film slot of the rod phantom. The irradiated films were marked at three corners with unique marks: Δ, X, O [Figure 3]b. Furthermore, these marks were aligned to sharp pins on the corners of the perspex slabs to identify the placement of films after exposure. This aids in scanning the films at the same orientation utilized to scan the calibration films. The handling and the calibration of radiochromic films follow the recommendations of AAPM TG 55. The films were scanned with an Epson Perfection V700 photo scanner in transmission mode and saved as RGB uncompressed image file format (TIFF). The scan settings used a color depth of 48-bit color and 72 dpi resolution without color or sharpness correction. An in-house designed software known as FilmReader was used to process the films, and evaluation tools were developed to assess different gamma criteria. In addition to the film reader software, we also used the commercial filmQA pro ™ software (Ashland, USA) for our analysis. The multichannel dosimetry method was adopted to eliminate any uncertainty with film response at high doses. The AC is a cylindrically shaped phantom with dimensions of 21 cm array length and 21 cm array diameter. It is composed of 1386 n-Si diodes (0.8 mm × 0.8 mm) arranged in a helical shape at 3 cm depth along the long axis of the phantom. The detectors are spaced 1 cm center-to-center and measure both entrance and exit doses during irradiation., The detectors are embedded at 2.9 cm from the outer surface of the device and the measured doses by these diodes are unwrapped onto a flat plane. The AC phantom was scanned in a Philips Brilliance CT Scanner, and a Hounsfield value of 165 (1.15 g/cm 3) was assigned to the entire phantom in Eclipse TPS. The verification plans were created by importing the AC phantom and overlaying the SABR treatment plans onto the AC phantom. The SNC Patient™ software (Ver. 6.6) (Sun Nuclear Corporation, USA) was used to compare the measured the calculated dose imported from the TPS. [Figure 3]c illustrates the comparison between AC measured fluence and the extracted fluence at measurement points from Dicom RT dose and RT plan. The AC and Rod phantom measurements were performed at patient specific gantry angles. The planned and measured doses from the AC device were compared using four different gamma criteria: 2%, 2 mm, 3%, 2 mm, 3%, 1 mm, and 3%, 3 mm. The gamma evaluation was done in absolute mode with 10% threshold, and global normalization was adopted for analysis. We also investigated the relationship between field size and passing rate by calculating the equivalent square field size (ESF) of the complex treatment plans. The ESF was calculated using the standard 4*Area/Perimeter relation expressed by the following relation: [(2 ab)/(a + b)]. In all cases, the minimum field size was restricted to 3 cm × 3 cm. The evaluation of gamma criteria for all twenty-five clinical cases was divided into three groups: (1) Lung (A), (2) Spine (B), and (3) Others (C) that includes sternum, ribs, scapula, and femur. 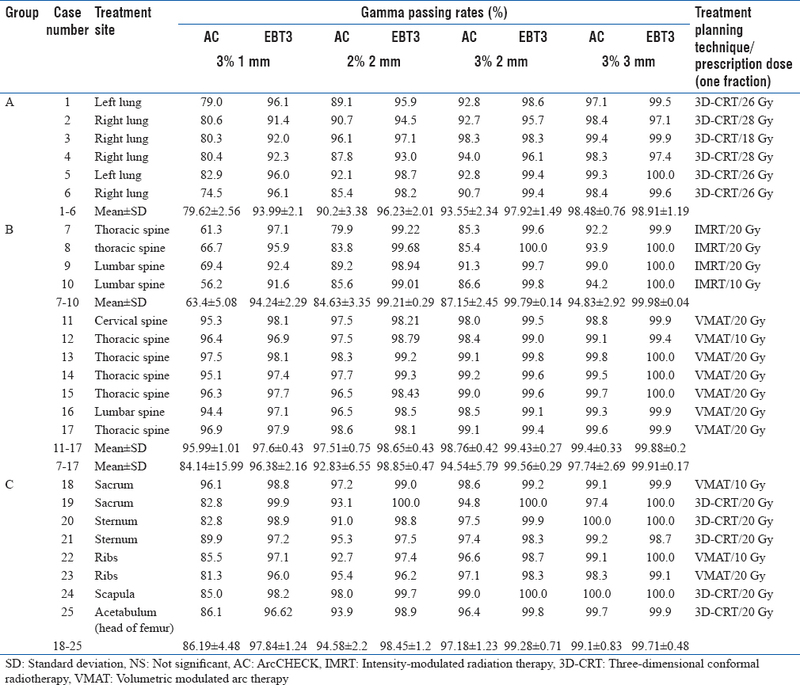 The differences in gamma passing rates between the AC and the EBT3 films utilizing four different gamma criteria for 3D-CRT, IMRT, and VMAT treatment techniques are shown in [Table 1]. For a gamma criteria of 3%/3 mm, Group A and Group C passed at higher passing rates for both AC and EBT3 measurements (>95%). 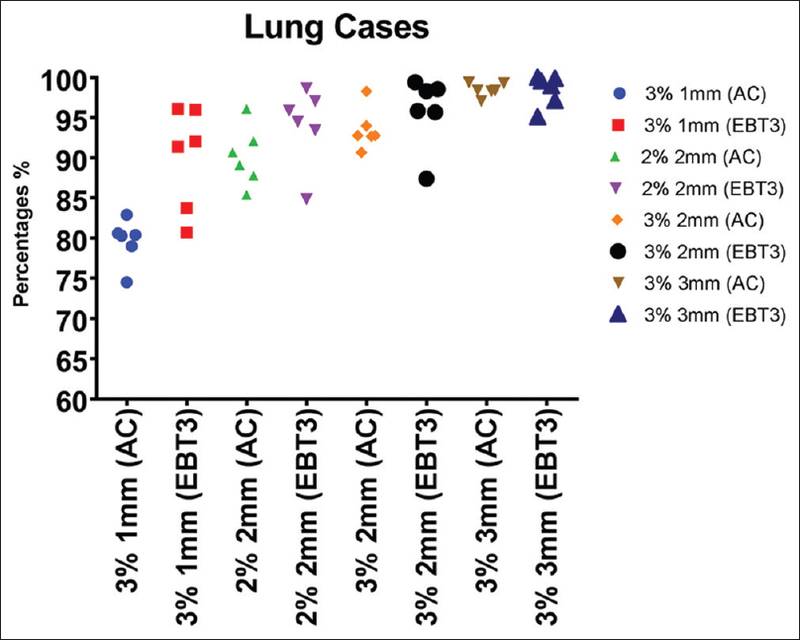 The mean passing percentage for lung cases (A) was 98.48 ± 0.76 and 98.91 ± 1.19 for AC and EBT3 films, respectively. Similarly, the mean passing rates for Group C were 99.1 ± 0.83 and 99.71 ± 0.48 for AC and EBT3 films, respectively. Group C patients had better passing rates (97.18 ± 1.23) with AC even at 3%/2 mm gamma criteria. The distribution of the passing rates at 3%/1 mm, 2%/2 mm, 3%/2 mm, and 3%/3 mm gamma criteria are demonstrated in [Figure 4], [Figure 5], [Figure 6] for groups A, B, and C, respectively. 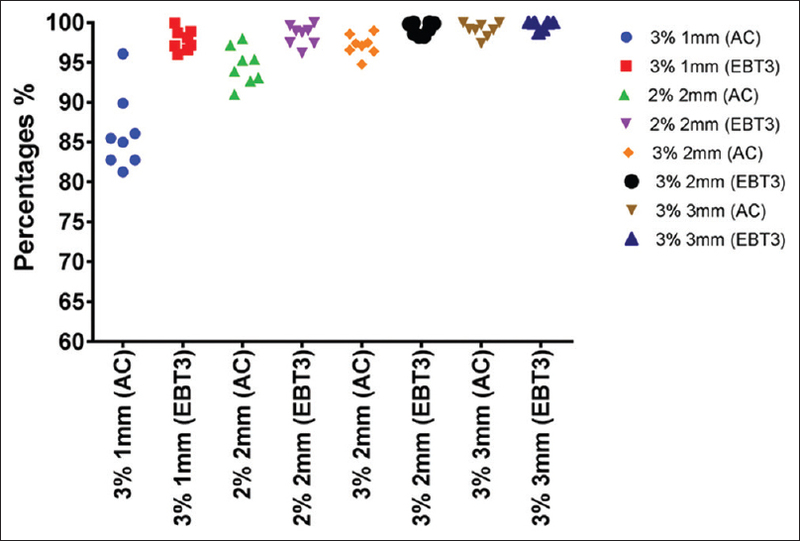 [Figure 4] illustrates that the distribution of gamma criterion 3%/3 mm for AC is close to EBT3 films with a passing rate of above 95% for all lung patients. Similarly, the performance of the AC measurements was in good agreement with EBT3 films measurements for Group C. Both techniques have very similar distribution for 3%/3 mm measurements [Figure 6]. The distributions of gamma criteria at 3%/2 mm for the groups A and C were close to each other [Figure 4] and [Figure 6]. The differences between the AC and the EBT3 films for Group A and C patients ranged from 0.02% to 8.70% and 0.99% to 5.20% respectively at a gamma criteria of 3%/2 mm. In the case of spine SABR, due to the proximity of PTV to the spinal cord, we used 3%/2 mm gamma criterion for evaluation. The mean passing rates at 3%/2 mm for AC and films for spine VMAT SABR were 98.76 ± 0.42 and 99.43 ± 0.27, respectively. All patients planned by VMAT including spine and sacrum showed more than 95% passing rates at 3%/1 mm, 2%/2 mm, 3%/2 mm, and 3%/3 mm with AC device and also correlate well with film measurements. However, for all IMRT spine SABR patients, the AC results were poor at 3%/2 mm gamma criteria. The mean passing rates for spine IMRT SABR with AC and films were 87.15 ± 2.45 and 99.79 ± 0.14, respectively. Even, the gamma passing rates at 3%/3 mm for all spine IMRT SABR cases with AC measurements ranged between 92.20% and 99.0%, and the mean percentage was 94.83 ± 2.92 [Table 1]. We also investigated if any association existed between field size and passing rates for IMRT spine SABR patients. [Figure 7] shows the relationship between gamma passing rates and field size. There is a good correlation between the equivalent field sizes of four identical plans of IMRT/20 Gy/10 Gy and gamma passing rate of 3%/2 mm with r2 = 0.97 [Figure 7]. It clearly shows that passing rate is dependent on the field size. Of all the studied IMRT spine SABR patients, one of the lumbar spine patients (case 9) passed at 99.0% and 100% at 3%/3 mm for AC and EBT3 films, respectively. 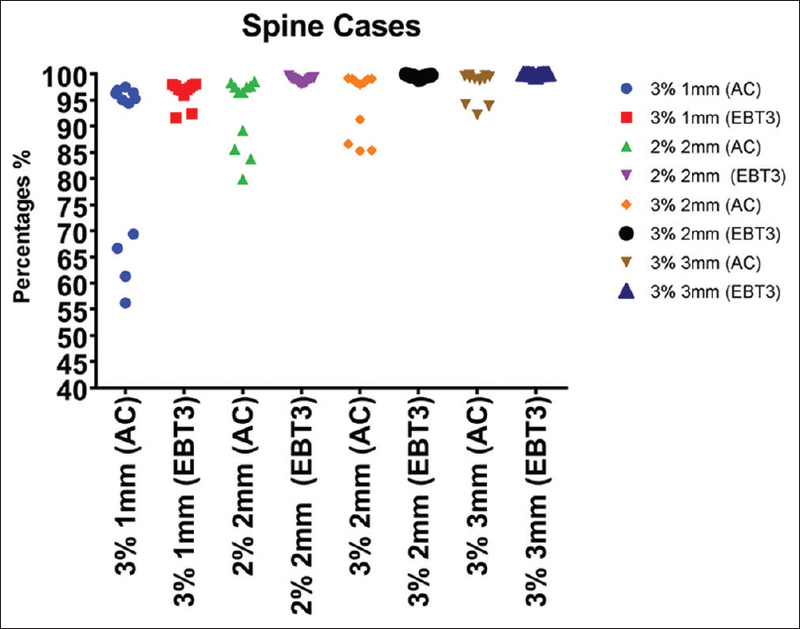 The higher passing rate at 3%/3 mm gamma criteria is mainly because of a relatively large field size (5.8 cm) compared to other IMRT spine SABR cases. Excluding this case would lead to a mean reduction of 1% in the gamma passing rate with the AC for 3%/3 mm criterion. Applying a strict gamma-index criterion of 2%/2 mm at 90% passing rate for all spine IMRT SABR cases resulted in none of the spine cases passing the gamma criteria whereas, in Group A, three out of six lung cases passed the strict gamma criterion for AC measurements. All studied cases in Group C passed the 2%/2 mm gamma criterion at 90%. This work investigated the feasibility of using the AC as a replacement for ion chamber and film dosimetry. The comparisons between these two techniques were achieved using the established gamma index method based on the concept of distance to agreement (DTA) and dose differences within predefined dose limits. The DTA is the distance between a measured data point and the closest point in the calculated dose distribution that displays the same dose. Several studies have used 3% dose difference and 3 mm DTA with 95% pass rate, 2% dose difference and 2 mm DTA with 90% pass rate to evaluate IMRT and VMAT treatment plans., In this study, we have used 3%/3 mm and 3%/2 mm for non-spine SABR and spine SABR respectively to compare the fluence measured by AC and films. The tighter gamma criterion for spine tumors is due the location and proximity of these tumors to the spinal cord. The gamma passing rate of 3%, 3 mm for the first and the third clinical Groups (A and C) showed excellent agreement between the two techniques. Similarly, the mean doses for the AC and EBT3 films for both groups were almost the same (at the 98% and 99% respectively) with a small standard deviation (1.19%). Three out of 6 cases in Group A, and all cases in Group C passed at 2% and 2 mm gamma criterion. Similarly, Group A and C passed at 3% and 2 mm gamma criterion. 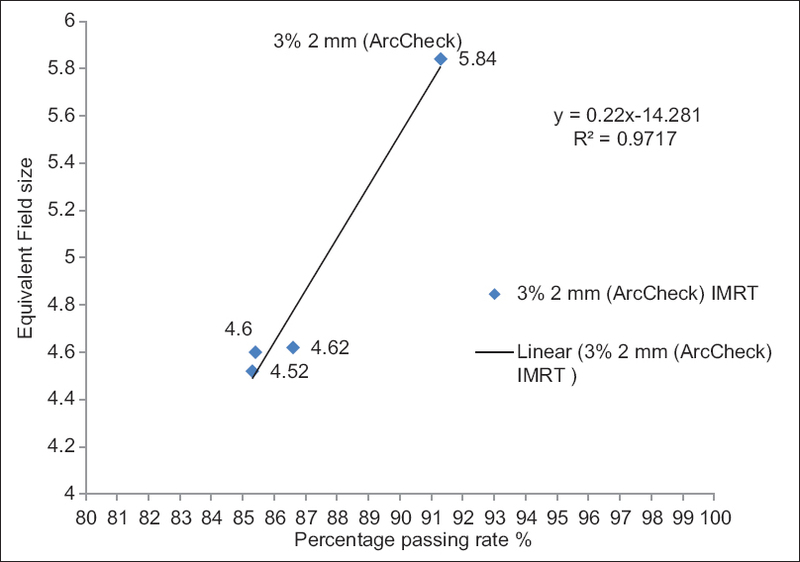 Spine SABR cases planned by IMRT proved not to be a good candidate for AC, with [Figure 7] clearly indicating that the passing rate is dependent on the field size. For these cases, our study indicates that the routine film measurements are required. Moreover, in case of spine IMRT SABR treatments, the spinal cord is so close to the target volume, and a slight setup error of a few mm would compromise the dose delivered to the target volume. Hence, it requires a high spatial resolution device to detect the rapid dose fall-off at the periphery of the target volume close to the spinal cord with limited number of static IMRT fields. Therefore, it is highly recommended to use EBT3 films for all SABR spine treated by IMRT. A study by Hussein et al. using five commercial QA systems (PTW 2D-Array, Scandidos Delta4, SunNuclear AC, Varian EPID, and Gafchromic EBT2 film) showed a lower concordance of the correlation coefficient for the EBT2 films with the predicted gamma index. This is due to noise artefacts caused by the intrinsic film heterogeneity. Moreover, the gamma index analyses in EBT2 films are disrupted with the variability of the scanning procedures. The only difference between the EBT2 and EBT3 used in this study is that the polyester layers of the EBT3 are symmetrical, resulting in reduced artefacts. In contrast, the AC technique results for the same study demonstrated superior statistical agreement with the predicted gamma value for the gamma passing criteria of 3%/3 mm and 3%/2 mm, respectively. The results of the AC for the first, third group and spine VMAT SABR of the second group emphasize the use of AC as a replacement to film dosimetry. AC was specifically designed for VMAT QA, and our results have demonstrated that AC could replace film dosimetry for spine VMAT SABR QA. AC uses diodes with excellent reproducibility and acceptable angular response. It provides good sensitivity for the detection of small gantry rotation offset and scaling errors as well as phantom set-up error. The introduction of SABR technique in radiotherapy has prolonged the working hours of clinical physicists. This increased workload necessitates an alternate QA method to manage the physics workload. The standard ionization chamber and film dosimetry approach involves a series of procedures that includes output measurement, film calibration, film scanning, pre- and post-film processing, specialized software to verify measured film and calculated dose. The EBT3 films usually consume significant time before and after the radiation exposure. Proper handling and preparing process include cutting to specific size (to create the curve calibration and patient QA), and labeling the films must be considered before the radiation exposure. The use of AC decreases physics QA time significantly. Furthermore, it enhances the physics throughput and minimizes human errors in busy radiotherapy centres. One of the limitations of this study is the restriction of minimum field size to 3 cm × 3 cm. The AC results at 3%/3 mm were in good agreement with the EBT3 film dosimetry for all non-spine SABR cases including lung, sacrum, sternum, ribs, scapula, and femur. In case of spine tumors planned by VMAT, AC results are comparable to films meaning that AC could potentially replace film dosimetry. However, for spine tumors planned by IMRT, AC results are poor, and film dosimetry is still required. We observed a significant reduction in QA time on using AC for SABR QA. This study showed that AC could replace film dosimetry for all sites except spine IMRT SABR. Soldà F, Lodge M, Ashley S, Whitington A, Goldstraw P, Brada M, et al. Stereotactic radiotherapy (SABR) for the treatment of primary non-small cell lung cancer; Systematic review and comparison with a surgical cohort. Radiother Oncol 2013;109:1-7. Rana S, Rogers K, Lee T, Reed D, Biggs C. Verification and dosimetric impact of Acuros XB algorithm for stereotactic body radiation therapy (SBRT) and RapidArc planning for nonsmall- cell lung cancer (NSCLC) patients. Int J Med Phys Clin Eng Radiat Oncol 2013;2:6. Gloi AM, Buchana RE, Zuge CL, Goettler AM. RapidArc quality assurance through MapCHECK. J Appl Clin Med Phys 2011;12:3251. Vieillevigne L, Molinier J, Brun T, Ferrand R. Gamma index comparison of three VMAT QA systems and evaluation of their sensitivity to delivery errors. Phys Med 2015;31:720-5. Myers P, Stathakis S, Gutiérrez AN, Esquivel C, Mavroidis P, Papanikolaou N, et al. Evaluation of PTW seven29 for tomotherapy patient-specific quality assurance and comparison with Scandidos Delta (4). J Med Phys 2012;37:72-80. Palmer AL, Nisbet A, Bradley DA. 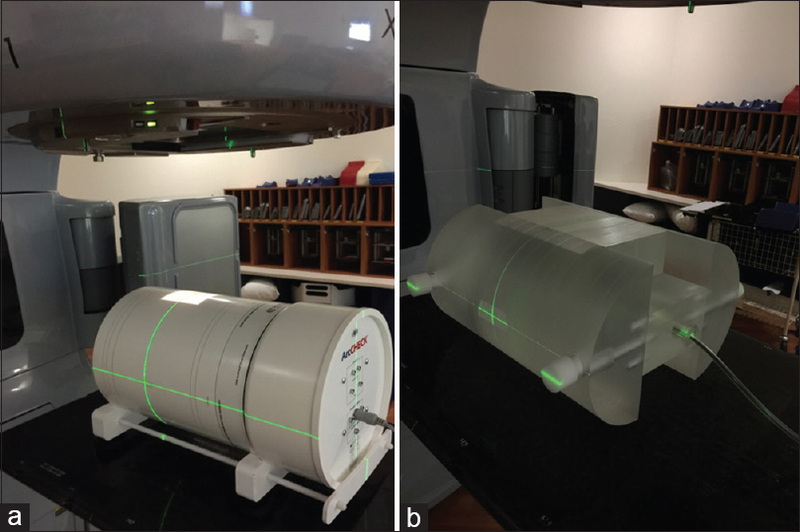 Semi-3D dosimetry of high dose rate brachytherapy using a novel Gafchromic EBT3 film-array water phantom. J Phys Conf Ser 2013;444:012101:1-4. Chaikh A, Balosso J. Assessing the shift of radiobiological metrics in lung radiotherapy plans using 2D gamma index. Transl Lung Cancer Res 2016;5:265-71.
International Specialty Products (ISP) Gafchromic ® EBT2 Self-Developing Film for Radiotherapy Dosimetry, Corporate Whitepaper; 2009.